Traffic to my site shot through the roof recently. Two of my posts made it to the front page of Google and have stayed there for a few days. One in particular hit at the height of popularity for its keywords. And they are super difficult keywords to rank for, including HostGator, BlueHost, and DDoS. I’ll tell you how I did it, what I had nothing to do with that played a huge role, and what happened to my site traffic stats and conversion rates over the last few days. Here are the two posts that shot to the front page of Google within hours of publishing. Before I checked my post rankings, I cleared everything out of my browsers, signed out of Google, and went incognito on Chrome and behind a “hide me” proxy wall. I also contacted a few buddies who have rather expensive toys for checking real post rankings. And then I put out a call to my Facebook buddies to check too. 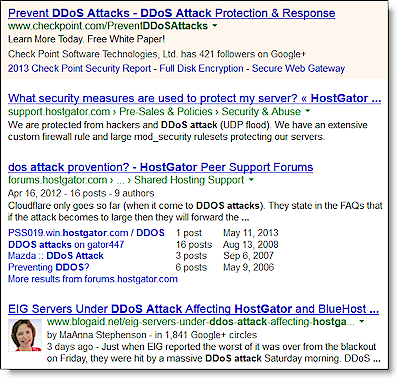 They all verified that the HostGator DDoS attack post was sitting in the #3 position of the organic results. It was under two results for the HostGator forum. (Shown below.) And verified that one of my posts was #1 over the last 30 days for three keywords. And yes, that’s my happy little, authorship-connected face you see next to the result. 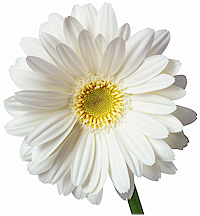 And when you click the byline on that result, the image below appears in the sidebar. The other post, for the initial blackout, was in the #2 position, right under Mashable. Not bad. A blackout on big hosting companies is news. HostGator and BlueHost were my preferred hosting vendors and my clients and I were on them. So, I’m going to get word out to as many people as fast as I can about what’s going on when something like this happens. Reporting on the news has gotten my posts to the front page of Google several times. Look at the titles of those posts. I used the same words that folks were typing in to find out what was happening. Those posts hit for practically every individual keyword and phrase related to the story. I did other basic SEO things throughout the post, but that was it. I didn’t spend hours going over it. There wasn’t time. And, more importantly, I’ve been doing this long enough to know how to do it well in the first place. So, SEO copywriting is a bit second nature at this point. Yes, I do some pretty decent on-page SEO and all. And yes, I have 14 authorship connections made. And I have an active presence on G+. And I write about hosting now and then. But none of that is enough to account for the ranking of these two posts. Here’s what is – freshness. Google seems to be favoring fresh posts on hot topics right now and will show those from non-authority sites over older posts from more well established sites. That, more than just about anything, accounts for why my posts hit the front page of Google for those keywords. Yes, all the other ranking factors contributed, but freshness was the catalyst. Glen Allsop at ViperChill has a super post on results he found when running different SEO tests. He includes lots and lots of screenshots too. One of the things he rants about is how freshness is goofing the algorithm. Yep, and that goof is what put my posts on the front page. Now, be careful with your takeaways from Glen’s post. He keeps his head in the SEO game like a day trader on the stock market. What works in the short term may not be good for you in the long term. Here’s what became of my site traffic the day that blackout post hit. It dropped a little on Sunday. Then my second post sent another spike on Monday. So, what has all that traffic done while on my site besides read the post they came to see? Lots. Bounce rate went down and time on site went up suddenly. Seems a bunch of folks poked around all over my site checking it out. A whole bunch of them signed up for my newsletter and RSS to email of my blog posts. And a whole bunch more downloaded free reports. And, more than the usual number of folks a day jumped over to my member site to check out the video courses. Since freshness is what I believe played the biggest part in getting my posts to the front page of Google, it’s likely they will drop off as other posts are written by folks who have a little bit of authority in the eyes of Google. But, a lot more folks found BlogAid, and many of them took action. That’s great! And, there will always be more news to report. In the meantime, I keep writing the best posts on the topics I cover. And I keep being active on G+. I keep building my authority and trust every day so that when news hits, I’m ready for Google and Google is ready for me.